There are about 500 species of Amphibians called Salamanders. They have thin bodies, short noses and long tails. Like all amphibians, They are vertebrates and are cold blooded. Most salamanders have 4 toes on their front legs and 5 toes on their back legs limbs. They have 4 legs like a lizard. They do not have claws. They can grip trees with their feet. They have moist skin because they live near or in the water. Most types of Salamander live in wetlands like a small streams or ponds. They are found in most parts of the world except for deserts and near the north and south poles. They are not found in Australia, Antarctica nor most of Africa. One third of the known salamander species are found in North America. Some salamanders spend their whole lives in water, some spend time in the water occasionally and some spend their entire adult life on land. Salamanders are able to grow back their limbs as well as other body parts when they are damaged, just like some lizards can re-grow their tails. However, they are more closely related to frogs and not lizards, even though they look more like a lizard than a frog. Most species of salamanders have small or no limbs making them look like an eel. They are often brightly coloured. Salamanders which stay underground are often white or pink. Most salamanders are quite small, but there are some really huge ones. They range in size from a tiny salamanders with a total length of 2.7cm (1 inch) including the tail, to the Chinese Giant Salamander, the biggest amphibian of all, which can reach up to 180cm (6 feet) and weigh up to 65kg (144 lb). Most salamanders are between 10cm-20cm in length (4-8 inches). They regularly shed the outer layer of their skin as they grow bigger – and then they will eat that dead skin! Different species of salamanders have different methods of breathing. Those which do not have lungs will breathe through their gills. Most of these gills are outside their bodies, located on either side of the head. Some salamanders live on land and have lungs to help them breathe. Their lungs are simple. Most species like the Olm have both lungs and gills when they an adult. Some salamanders which live on the land do not have lungs and gills – they breathe through their skin. Some species with lungs can also breathe through their skin. Salamanders’ skin produces mucus which helps to keep them moist when they are on dry land, and also helps them to maintain their salt balance while in the water. The mucus provides some kind of lubricant while swimming too, to help them slip through the water more easily. With the help of this lubricant and their webbed feet, salamanders are great swimmers. Watch out! Some salamanders produce poison from glands in their skin to protect them from predators. They have a sticky tongue which helps them to catch their prey. Some salamanders can shoot their sticky tongue far out to catch their prey. Most species of salamander have small teeth in both the upper and lower jaws, unlike a typical frog, which only has teeth on the upper jaw. Even the larvae of salamanders have teeth! Salamanders like to eat snails. They have a good sense of smell but they have lousy hearing. Most salamanders have good eyesight, except that those that underground have poor eyesight – their eyes may even be covered by a layer of skin. They use their eyes to hunt for food. Larvae and adult salamanders which live in the water have a special sensing line on their sides (just like fish do) to detect movement and vibrations in the water. This sensory organ protects them from their predators. They do not have external ear. They use their tail to escape quickly when they need to. When a predator attacks a salamander, its tail will drop off and wriggle around for a while and this will give the salamander a chance to escape while the predator is distracted by the wriggling tail. Within only a few weeks, salamander is able to grow back that missing tail or any other limbs it may have lost. Salamanders lay their eggs in the water. They spend the first part of their life in the water. The eggs will hatch into larvae. These larvae have gills to breathe. Depending on the species, the larval stage may or may not have legs. The larval stage may last from days to years, depending on the species of the salamander. Some species like Dunn’s Salamander has no larval stage. The babies look like their dad and their mum. The number of salamanders in the world is going down due to people destroying forests and wetlands, and due to climate change. 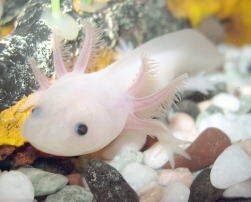 Hey, do you have any idea how big they grow because all the recent websites say the Axolotls grow up to one foot (10-12 inches). Is that true???????? i’m deciding weather I should get one. If you could help, greatly appreciated. whats the name of the pink salamander?